WanderChic is always up for some schooling about fashion, especially from the pros. While on the road in LA, Maggie Glover shared her style. Maggie is the Head of Community at ModCloth.com and the Social Media Director of failbetter.com, an online literary magazine. Her poetry has appeared in Verse Daily, PANK, Smartish Pace, Pebble Lake Review, The Journal, 32 Poems and other literary journals. She lives in San Francisco with her fiancé, Marc, and her cat, Sicily. MG: I started working as a fashion writer for ModCloth in August of 2008. I applied for the job while I was finishing my MFA in poetry in West Virginia, and decided that I wanted to move back to my hometown of Pittsburgh when I was finished. When I started at ModCloth, there were only about fifteen of us working out of a small, converted warehouse in the Strip District of Pittsburgh. Since then, the company has grown tremendously, and I’ve had the pleasure of working in several different roles, such as the Social Media Coordinator and Marketing Campaign Manager. Currently, as the Head of Community on the Marketing Team in our San Francisco office, I lead a team whose focus is on community-building through site features like Be the Buyer, as well as providing style advice to our customers through one-on-one style consultations. Oh yeah, and I pretty much do buy everything. At any given moment, I have at least 20 items in my shopping cart. It’s ridiculous. WC: How does your poetry training pay off at your job? MG: The two fields are more related than you might think. Writing is all about audience, and the best writers are those who have a firm understanding of their “ideal reader.” Marketing is the same way. At ModCloth, we are always thinking about our audience (our customers or potential customers), how they will be affected by the promotion of our products and how they will interpret our messaging. In addition, my experience in creative writing workshop environments has taught me the importance of listening to others’ feedback, but ultimately making my own decisions. Everyone will always have an opinion about my work, but I need to decide for myself whose opinions are the most relevant to my own objectives. WC: Are you still writing poems? Are you ever tempted to write poems about wedges or tote bags? I have written a few “fashion-y” poems, including this poem, published by PANK magazine, entitled ““THAT BAG IS SICK IN THE HEAD!”: A SONNET FOR MARC JACOBS,” I wrote this after watching a documentary about Marc Jacobs and Louis Vuitton. I was inspired by his design process, and its similarities to the writing process. WC: How would you describe your own style? MG: I tend to have a flair for the dramatic, but I also like to be comfortable, so I’d probably describe my style as “relaxed experimental.” There’s nothing I love more than a gigantic Jeffrey Campbell wedge paired with leggings, a casual, breezy dress and a charm necklace. 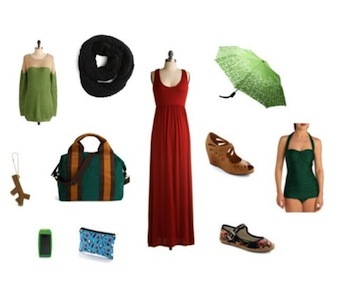 WC: What are some of the best or most loved ModCloth items for travelers? WC: When you travel, which items are you sure to bring with you? Trashy tabloid magazines. They really take the edge off of travel headaches. WC: I’m on the hunt for the perfect travel bag. Any recommendations? MG: It’s so funny that you asked me this, because I have also been on the hunt for an ideal travel bag, too. I really need a new laptop bag, so I have my eye on our Upwardly Mobile Satchel in Green. WC: What have been some of your recent trips? Do you have any travel coming up? MG: I’m actually writing this from LA right now. I’ve been here for about a week and am flying back to San Francisco today. Then, I’m headed to Chicago in two weeks for the AWP writing conference, and have a trip planned for NYC in June to visit a friend who lives in Brooklyn. I’m also hoping to travel to Barcelona this summer. However, the upcoming trip that I’m most excited about will happen in June of 2013: I’m getting married in Maui, HI, followed by a reception back in our hometown of Pittsburgh, PA!